There's a scene in the classic Star Trek episode "Patterns of Force" that always comes to mind when I read Nazi-era histories. In the episode, Enterprise is called to the planets Ekos and Zeon to find out what happened to the Federation's cultural observer, John Gill, who's disappeared. They discover Ekos ruled by a Nazi Party identical in every way to Earth's, down to the very uniforms; led by the Fuhrer, John Gill; and embarked on a campaign to finally eradicate the Zeon "scum" (the Zeons all had Jewish names - Star Trek was not known for subtlety, even in her best episodes). The scene in question occurs late in the episode; Kirk and Spock have penetrated Party HQ to confront Gill and Kirk asks him, "Why Nazi Germany?" Gill replies that it was the most efficient state Earth ever knew, and Spock concurs. The historian in me always cringes at that because Nazi Germany was one of the most inefficient and corrupt examples of a modern state one could conceive of. What efficiencies pertained were offset by the feudal structure of the regime; rivalries between Party, civil service & the military; and the personal leadership of the Fuhrer. 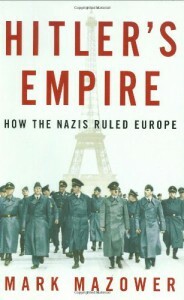 All this and more is documented in Mark Mazower's look at how the Nazi's ran Germany and their empire. The book is divided into 3 parts. The first 2 focus on Nazi Germany primarily during the war years; there's almost nothing about National Socialism's domestic policies from '33 to '39 (for those interested, see [author:Richard Evan's] [book:The Third Reich in Power]). The final part, "Perspectives," looks at some of the fallout from the Nazi era. "For Greater Germany": Chapters 1 and 2 in this section offer a brief overview of German political history from 1848 to 1918. Here, Mazower makes several important points. First, the roots of the Nazi's New Order lay in traditional German aspirations to unify all Germans and become the dominant European power. Aspirations reinforced by Wilson's idealistic (and, in practice, unworkable) notion of self-determination set out at Versailles. A second point is that German society always had strong anti-Slav and anti-Semitic strains. In fact, all of Europe had powerful anti-Semitic movements. Nazism was a particularly psychotic and toxic expression of sentiments very common Europe-wide. A third point is that, while Nazi occupations were lethally brutal they weren't all that moreso than standard Wehrmacht policy as evidenced by Germany's treatment of Belgium and Poland in the Great War (the consequences of this brutality are explored more fully in section 2). Nazi racial ideology played a significant role in the difference. In the East, especially, the Nazi's were far more brutal. Germans felt themselves to be morally and racially superior to the Slavs. In the West, in countries of fellow Aryans, the conquered were treated more leniently and non-Nazi elements were able to retain control till late in the war. Furthermore, in many countries conservative, right-wing parties actually welcomed the chance to eliminate center and leftist opponents. In the West, Germany's primary objective was to keep things quiet so it could focus on the East. A final point Mazower makes is that the Nazi's were caught flat-footed by their successes. The morass of Party fiefdoms and competing ministries emerged because they couldn't plan ahead and all important decisions went through Hitler, who liked to play his people off against each other. A few thoughts from the later chapters of section 1: Two things stood out to me - The Nazi's drive to create a Greater Germany and weed out the untermenschen who were contaminating it foundered on the fact that their racial ideology was nearly incoherent. Since it had no scientific, cultural or linguistic validity, the Nazi's were unable to define "Germanness," and so, depending upon the gauleiter in question and the exigencies of wartime needs, "Germanness" could mean just about anything. A second facet of Nazi government that I found interesting is Mazower's argument that there were 2 visions of the New Order. The old-time Party hacks preferred what Mazower calls "decentralized chaos" - a mode of governing which had characterized Nazi rule since they had come to power. A second vision, supported by the SS and the civil service, was a "lethal excess of centralized order." It's here that one catches a glimpse of what a Nazified Europe may have looked like - death camps, secret police, the brutally efficient regime mythologized in Star Trek and other venues. As the war progressed and the inadequacies of that first vision became apparent and crippling, Himmler managed to grasp greater and greater power for the SS both inside Germany and in the Occupied Territories. "The New Order": In section 2, Mazower takes a closer look at aspects of Nazi rule, beginning with "Making Occupation Pay." The driving reason behind all of Germany's decisions regarding policies in the Occupied Territories was how it could benefit the Reich. Absolutely no regard was given to the economic effects on the conquered or even allied nations. Just as with economic policy, Nazi ideology blinded them to diplomatic opportunities to sow goodwill. It may be hateful to the wartime myths of Europe but many nations before 1945 were quite willing to consider working with Germany. It's the Germans themselves who made it impossible by insisting on a Europe that existed for exploitation by Germany. Fascist movements and other right-wing parties were increasingly alienated by the high-handed and inept diplomacy of the Reich. Despite that, before it became clear Germany would lose the war, collaboration with the Nazi regime was widespread since it often resulted in the enrichment of private corporations (like L'Oreal, Mercedes, and others), and could be argued as the only sane course in a Europe that looked to be a Nazi garden before 1942. The opposite of collaboration is opposition and Mazower offers a typically nuanced view of that aspect of the Nazi era, as well. As was true elsewhere, Germany's wartime fortunes generally dictated how opposition developed: Before the great reverses of 1942-43, opposition in the West was almost nonexistent; and when it did arise, the German response against civilians was so vicious that most gave it up as too costly. Over the course of the war, especially after the Allies breached Festung Europa in 1944, the Resistance of myth finally coalesced and began coordinating operations with the Anglo-American command despite continued German reprisals. In the East, the opposition developed earlier, particularly among the Jews and the Poles, both of whom quickly realized that German intentions toward them gave them nothing to lose. Many may remember the destruction of Lidice after Reinhard Heydrich's assassination but this was the typical response to such incidents! After a time, the roll call of slaughtered civilians becomes mind numbing: In Belorussia, upwards of 375,000 died as a result of reprisal actions alone (p. 487); in Yugoslavia, 10,000 were rounded up in retaliation for raid and 2,300 were immediately shot (p. 483); and in the Warsaw Ghetto there remained (at most) 70,000 Jews in 1943 from a 1941 population of 450,000 (p. 494). Hitler's Empire goes on for 672 pages of text, notes and sources so it should be obvious that I've only sketched out the roughest thumbnail of Mazower's arguments (despite this review's length), and I have refrained from drawing the obvious parallels with our own recent history, and the fragility of liberal democracy. I can only urge the interested to go out and find a copy of their own to read.